Holy Cow, I’m in India! 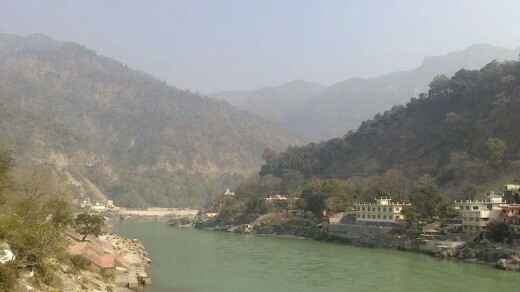 So, I’ve been in Rishikesh for almost 2 weeks now, I set off on the 3rd February from Heathrow. The reality of leaving for India really hit me on the journey to the airport, I can’t remember ever feeling so sick with nerves luckily I had my good friends Muni and Flipflop to accompany me and they’d even put together a play list of my favorite songs for the road trip! I was greeted at the hotel with a necklace of beads and a red bindy spot on my forehead (I’m just gonna go with it!) And was shown to my room. I was feeling pretty poorly so I more or less went straight to bed. Ramana’s garden was just next door, down a lane and through a cast iron gate. Even though it was so close it took me a long while the next day to pluck up the courage to go down and introduce myself. I felt quite lonely and slightly intimidated by my new surroundings, but you’ve just gotta bite the bullet! Off I went, I found another volunteer who immediately knew who I was and told me to head down to their café. Since then, Ramana’s has done nothing but welcome me in. I have spent a lot of time in the cafe, the kitchen is run by a Nepalese family who cook all the food which is grown organically on the land of Ramana’s garden. It’s really very popular with the tourists and all of the proceeds go to the children’s home and school. At the moment it seems to be the main income for Ramana’s and it’s children, so it’s a vital part of the project. The food is delicious too! The children at Ramana’s are brilliant. They bring a lot of laughs and they all seem to do a really good job of looking after one another. It’s not how you’d imagine an orphanage when you see this type of thing in the media. Yes, the kids have come from some of the most deprived backgrounds and life traumas, but you would not know it from being in their home now. I truely believe that Ramana’s Garden Children’s Home is an amazing project. It provides the children with a good education and financial support for when they move on into further education and work. Without it, the opportunities open to these kids is pretty bleak, and they would remain at the lowest level in society. I work with a group of six children in the afternoons for their tutorials, it’s just a chance for them to do their homework and play some games before they unwind at the end of the day. They normally have maths, English, Hindi or social studies. Helping the kids with this has reiterated to me just how much I do not enjoy maths. I can’t remember how to do long multiplication and don’t even start me on their technique on division! Hooray for calculators is all I can say!! Are you smarter than a ten year old?! No I am not. When I set out on my trip two weeks ago, I was apprehensive about being on my own. I needn’t have worried, because I am really not… There are so many people to meet and I’ve only just met a handful! Have I really been here over a month already? The time has flown by! With so much going on at Ramana’s it’s so easy to lose track of the days. In the last couple of weeks, Rishikesh has been filled with yogis heading here for the annual Yoga Festival, the largest of it’s kind in the world. All kinds of spiritual celebrities have graced the town with their presence. It’s been such good business for Ramana’s Garden as the cafe has been extremely busy so the profits and the kids tips are surely benefitting! It’s also a really good chance to spread the word about the work happening at the school and to get new people interested in sponsoring the cause. The kids have just restarted making jewelery to sell too, it all looks so professional and when a peice is sold, the money is put into that child’s own account ready for when they move on into work or further education. In the past couple of weeks the children’s home has taken in a new little girl, Vimla, who was found on the streets in a nearby city. She has severe learning difficulties and possible epilepsy. Ramana’s are still trying to trace her mother as it is unclear how they became separated, but it turns out that the mother is mentally disabled also, which leads you to question the circumstances in which this little girl came into this world and the prejudice both mother and daughter must have endured in a country which is less than hospitable to anyone with a disability. Vimla seems happy enough at Ramana’s and she has a smile which brightens the day and it seems she is a girl after my own heart, who just loves random outbursts of song! Nothing wrong with that! She is starting at a school tomorrow which specialises in education for children with disabilities, so toes, fingers, elbows and eyes crossed that all goes well and she can get the care and education she so much deserves. Most of the kids have exams coming up this week so it has been the daily battle in tuition to get them to sit quietly and revise. Some say bribery doesnt pay, but we’ll see about that! I’ve also been helping out with lice treatment, the kids are trying a homeopathic remedy which means it is chemical free and after 5 treatments they say the lice will never come back. If it works I will be very impressed! At the moment there is still a lot of head itching, I notice myself doing it too lately but I’m hoping it’s just out of sympathy or paranoia! I feel very lucky to be working with all the volunteers here who each have their own reasons for being here and helping out. We are all different nationalities and ages so I guess it gives us a lot to talk about. I think that’s the best thing about spending time in new places, it’s often the people you meet who make it most memorable. I’ve reached the 2 month milestone which means I’m halfway through my stay in India. Seriously, where is the time going!! It’s beginning to get very hot now, the weather is due to get hotter and hotter in the next couple of months so by the time I hit Delhi I should be at boiling point. Didn’t I plan that well?! The kids go up to their Mountain project over the summer holidays to escape the heat in Rishikesh. Last years trip proved problematic due to the terrible flooding which killed hundreds of people and destroyed mountain villages and homes. It also flooded parts of Rishikesh but they seem to have recovered from it relatively well. The 17th March was the celebration of Holi, The festival of Colour. So whilst the rest of you were sipping on your Guinness, I was busy getting covered in coloured powder and water. It’s been 3 weeks and I still have pink hair!! All of Ramana’s Children’s Home (kids, staff and volunteers) took a 6km walk to Phoolchatti Ashram to celebrate. This is the place where Ramana’s Garden began, so it was lovely to see where the seed was planted and also to celebrate Prabha, the founder’s, birthday there. Everybody threw colour at each other, even the Nepalese kitchen staff got in on it! Great to see everybody so relaxed and enjoying themselves. Once there was no more colour to throw we washed off in the Ganges and ate an amazing picnic off plates made from leaves. The following day I intended to go for a quiet breakfast but got caught up in the street celebrations and again got COVERED in colour! I really think this is how everybody should see in the start of Spring! It is definitely the highlight of my trip so far! The children’s exams have finished so they have had a week off school before collecting their results. The volunteers have put on art and English workshops to keep the children a little occupied. Five of us took some of the younger children down to Ram Jhula to watch the Aarti. This takes place every evening at sunset, where people come to chant and then send fire lit flowers floating down the river, I believe they do it to celebrate the Ganges River. It was a really great atmosphere down there and the kids got to paddle in the river, but I’m fairly sure they were more excited playing with our cameras than the actual ceremony. And yes, even 6 year old Indian kids take selfies! The little girl, Bimla, who I spoke about in my previous post, is doing OK. She is enjoying her new school and her mum has been found! The two were reunited a couple of weeks ago and they are settling into a small room in a local guest house. The future is starting to look brighter for Bimla. Her mum will probably continue to beg as it’s all she knows, but at least Bimla has somewhere safe to live, is getting an education and they are both part of Ramana’s should mum want to accept the opportunity. There are still challenges with the situation but they are being covered one step at a time. In the past few weeks the volunteers have been sorting through the children’s clothes, putting the winter stuff into storage and deciding who needs what for summer. The children make me laugh how fussy and fashion conscious they are, just like any other teenagers really, but the clothes that aren’t suitable for the kids get taken down to the slums in Rishikesh, so none of it goes to waste. My friend, Lulu, another volunteer, had spotted a local family living on the streets with a new born baby. The last time Lulu and I saw the baby she had no clothes so we sorted out a few babygrows and t-shirts and took them down to them. They seemed to be very grateful, the baby was 6 weeks old and so tiny. It really feels like we are living in a different world when you see the amount of poverty here. When a problem is so vast, where does the country start? So it’s time I moved on! Rishikesh has been a great starting point for my trip, I felt at home here in the first week and working at Ramana’s Garden Children’s Home has been an unforgettable experience. All of the children have been so welcoming to all of us volunteers to have us in and around their home. Each child has such an amazing and unique character and had me laughing on a daily basis! Of course there are always obstacles to face and, frustrating at times, but it has been a fantastic learning experience for me and I really look forward to returning here in July and August. The monsoon season should be fun too! It’s a lovely, cool, fresh day today, a little windy and rainy but it’s nice to have a break from the heat the last few days. Usually we would take the kids down to the Ganga to do all their laundry but today they are having a visit from the dentist, watching a film about the importance of brushing their teeth. Maybe they will give their sweets to all the volunteers from now on?! Maybe not. Whilst the kids are occupied with that, its meant I’ve had my first full day off since I arrived on 4th February! Get in!! I went for breakfast this morning across Laxman Jhula bridge, for chai (I may have gotten myself an addiction) and aloo parantha (chapati stuffed with potato) YUM! Some of the children put on a dance show last week, it’s all choreographed by 2 of the older girls and a lot of the kids get involved. They are all so very talented. The girls are just super cute and the boys cracked out the hip hop, street dance to mix things up a bit! Every Saturday evening some of the children take part in a dancing and music show at Ananda which is an expensive hotel up in the Mountains. The last two times they have performed they impressed people so much that one group have offered to fund 15 children’s education next year. As a reward for all the children’s work and wonderful performances they got to go to Fun Valley Water Park! And I went too! It was such a great day, we piled the kids into 4 rickshaws and chugged our way on the hours drive. There were strict rules about what we could wear, it had to be made from polyester and for girls had to cover shoulders, cleavage and knees, otherwise (and I quote from one of Ramana’s boys) “there are a lot of crazies in there, they are worried that men will hoot and holla at you “. I see. So once we all had appropriate attire and looked the most practical and unattractive, we ventured into the park. We were advised to go on the rides first as it’s best not to go on them after being in the water in case of electrocution. Fair point. The first ride we found was a kiddies train. We started on our merry way around the track, stopped due to a power cut, got out, got back in, the train started up again then 30 feet on, another power cut. We got out and moved on. The water slides were a safer bet! I spent a lot of the day with Bimla, she was in her element as soon as she got in the water, the biggest struggle was getting her to come back out! The older kids prepared the packed lunches, we had Nutella and cheese spread sandwiches. I try to live by the saying “do one thing everyday that scares you”, that was my thing, and actually as far as odd concoctions go, it was ingenious! All of the kids had a fantastic time and were completely worn out by the end of it! I left my guest house last week and have moved into Ramana’s. It’s great living on the inside to get even more involved and I’ve got a really cozy little room which is sometimes used for meditation so it’s decorated with healing crystals and faces of gurus! I’ve named it ‘Alice’s Cave of Calm’. The early mornings have begun though, up at 6 each morning to check the kids are getting ready for school. I have sworn all my life that I am allergic to mornings so the first few have been tough! At least the sun is already shining and it’s lovely receiving so many little hugs so early to start the day. It’s strange to think I only have 2 weeks left in Rishikesh. The children head off to their mountain project in a couple of weeks to get out of the heat here. It’s 40°c and its not even peak summer, so it seems like the sensible option. I, on the other hand, am venturing down into the firepit of Delhi and Rajasthan to start my 20 day tour, embarking on a 3 day desert camel safari and to melt away in a pool of sweat. Besides the heat, I am really excited about experiencing different cities in India, visiting the Taj Mahal, and meeting up with a new group to travel with. Bring it on! I came back to India on 7th July, I loved my time in Nepal and I had some amazing experiences, it’s such a beautiful country and I hope to return again one day for more trekking. After my final, quiet week in Pokhara, I was ready to jump back on the plane to India. If I compare my journey back to Rishikesh to how I felt when I arrived for the first time in February, the feelings are so different. The apprehension had gone, I felt calm and happy to return to a place which I feel so familiar with now. From the taxi I walked down the dusty lane, through the gate once again and straight into the home of Ramana’s Garden’s children. The first thing that I noticed was how much greener the environment was, how much the trees and plants had flourished and how flipping humid it had become! Sure signs of a healthy monsoon. Having not spoken properly for about 6 days, I was lost for words when I first saw everyone but it didn’t take long to find my voice again and the children definitely still have theirs! I caught up with the other volunteers and moved into my guest house. So, that’s me settled for the next 2 months. The cafe is now closed during the low tourist season, and with the few volunteers at the moment it’s a relief. I’ve spent a fair few hours in various hospitals for kid’s appointments since being back. The trip to the orthodontist to get a girls brace fixed took me back, another girl had to have laser eye surgery to remove cataracts and a trip to A&E with a lady was required as she nearly chopped her finger off with a kitchen knife! Ramana’s are supporting a little girl from the local area who had a cornea transplant a few weeks ago. The transplant was sponsored by the hospital. Before the surgery the child was completely blind in one eye and partially sighted in the other. The eye in which she was blind had the cornea transplant, which was a success. On the way for a check-up at the hospital she saw her Grandad in the street and waved to him from the car. It’s incredible to think that until two months ago she would not have known he was there. It’s sometimes all too easy to take these small moments for granted. A lovely volunteer, Marta, treated the children and staff to a trip to the newly refurbished cinema in Rishikesh with some money she had raised back in Spain. It was a Bollywood called ‘Kick’ featuring the kid’s favourite, handsome actor, Salman Khan. All of the children loved it, I tried to get English translations from the 7 year olds I was sat between, but they were far too absorbed to care about my lack of understanding, but I enjoyed the popcorn and the dancing. The monsoon is a tough season, particularly for the kids. The weather is uncomfortably humid unless it’s chucking it down with rain, washed clothes rarely dry, the mosquitos are out living it large and wounds take forever to heal. One little girl had to have her lovely, long hair shaved off as she had a fungal infection on her scalp. The head shaving ceremony was a traumatic event for everyone involved, but thankfully now the wound is healing and her hair will grow back… eventually. Amongst all of this, I am building a strong stomach for blood and gore. Every cloud! The last few days has seen A LOT of rain! The Ganga is so high and flowing too fast. Hundreds of people have lost their homes up in the mountain villages and numerous people have died in the floods and landslides up in the mountains. The conditions are not nearly as bad as last year though, when more than 20,000 people were killed. The wall to Ramana’s Garden Cafe was in danger of collapsing too, so it was all hands on deck to carry sand down to the cafe to help support the structure! I don’t think I will be going into construction work anytime soon. The 15th August was India’s Independence Day. The children in Ramana’s School put on a dance performance to celebrate. One of the lovely teachers here insisted that all of us volunteers wore a sari for the special day too! The kids all worked so hard to put the show together but the heavy rain caused powercuts so it had to be cut short. Oh, the monsoon!